I showed you a card yesterday using the To You and Yours stamp set and I have another one to share today. Personally, I have really grown to love this simple set. It is simple but it's also very elegant and I love that about it. This card was hard to photograph because the front is done on acetate. I hope I got a good enough picture of it for you to kind of see it. I have to say it really is beautiful in real life. I hope to be back tomorrow with another project. I am busily preparing for my Christmas Giftables class which is tomorrow night. I'm so looking forward to sharing such fun projects with a great group of ladies! This is a beautiful card! I still haven't tried stamping on acetate. LOL You did an amazing job with it! I love the acetate! 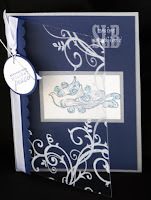 Like Amy, I haven't tried it yet, but am amazed at how beautiful this card is!